If you're looking for a creative Christian gift idea for the parents of a precious newborn, consider the The Original Birthday Present™! This keepsake is a great gift for baby showers and dedications. Each gift has 24K gold in an oil suspension, genuine frankincense oil, and myrrh oil all in pretty crystal clear bottles with gold caps. These are the same gifts the wise men brought to Jesus at His birth and they have great significance. 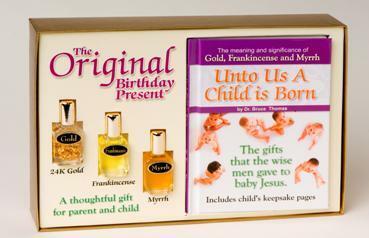 Each Original Birthday Present™ comes with a keepsake book which celebrates the destiny of baby Jesus and the great potential of your baby through the object lessons of gold, frankincense and myrrh. This illustrated hardback book includes child keepsake pages for hand prints, your child's photo, a place to record details of the birth, and a family tree. 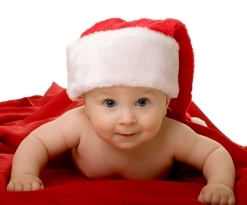 Celebrate the baby's birth which is relevant all year round. Please be sure to check out refund/policy prior to your purchase. Now you can purchase The Original Birthday Present™ for only $14.95!